Nearly 2,000 planets have been discovered outside our solar system, but this just might be the strangest one yet. A lava-loaded “super earth” called 55 Cancri e is twice the size of our own planet but eight times as dense. And it’s so close to its star that a year lasts only 18 hours. 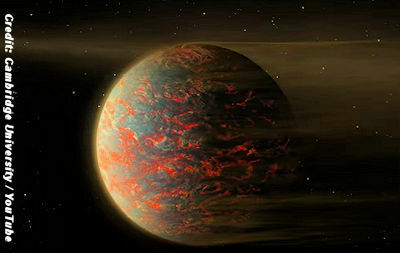 Just 40 light years away, 55 Cancri e may also be tidally locked to its sun the way the moon is to Earth. One side would be a blazing hot eternal night with temperatures of 2,000 degrees Fahrenheit, and the other an even hotter permanent day, according to a heat map of the planet published in the journal Nature that used data from NASA’s Spitzer Space Telescope.